NOTE: The CDC has identified parts of Miami in South Florida as an affected area of the Zika outbreak. Pregnant women are advised to be cautious as the virus can lead to birth defects. Adults affected by the virus experience fever, rash, joint pain, and conjunctivitis (red eyes) typically lasting a week. You can learn more by visiting the official CDC website. Florida is the most south-eastern state in the United States of America. Known as "The Sunshine State", it became a popular winter destination for the well-to-do from colder climates over a century ago, and has gained ever greater popularity since. Its roots in agriculture are still present, with tropical fruits being a chief export. The capital of Florida is Tallahassee, located in the eastern portion of the Florida Panhandle. The beaches are among the most popular attractions, along with some of the world's best known theme parks, including Disney World, Universal Studios, Busch Gardens and SeaWorld. However some of Florida's best-kept secrets are in secluded locations away from tourist areas, but well worth seeing. Florida has something to offer for any kind of traveller. Cities include the State Capital of Tallahassee, Destin, Pensacola, and Panama City Beach. The most culturally "Southern" part of Florida, anchored by the vibrant, cosmopolitan city of Jacksonville. Historic St. Augustine and the college town of Gainesville are other destinations. Theme park capital of the world, hosting Walt Disney World, SeaWorld, Universal Studios Florida, Kennedy Space Center, Cypress Gardens, Daytona International Speedway, and Gatorland. Home to the beaches of Miami, the jungles of the Everglades, and the beauty of the Florida Keys. Below is a selection of nine of Florida's most notable cities. Other cities can be found under their specific regions. Fort Lauderdale - The "Venice of America"
Amelia Island - Upscale beach resort island just north of Jacksonville. Biscayne National Park - The largest marine park in the country. Canaveral National Seashore - 24 miles of public, undeveloped beach. Castillo de San Marcos and Fort Matanzas - The nation's oldest settlement, full of history, a short drive from Jacksonville. Everglades National Park - Thousands of acres of swampland, full of endangered animals, and a UNESCO World Heritage Site. Florida Keys - Countless beautiful islands and beaches two hours south of Miami. Gulf Islands National Seashore - Numerous barrier islands on Florida's Gulf Coast. Kennedy Space Center - The site of all manned space launches in the country, and home to a huge visitor center. 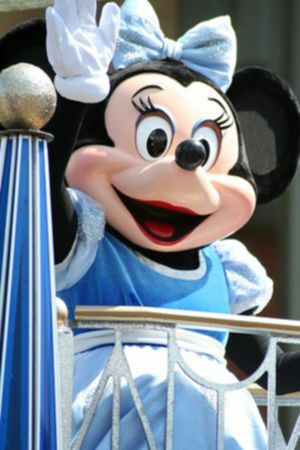 Walt Disney World - The world's most famous theme park, and a 30-minute drive from Orlando. Florida is the most southern of all U.S. states other than Hawaii and is a unique blend of societies. The northern part of the state is part of the cultural region of The South, where you will find traditional southern cooking, entertainment, dialect, and lifestyles, much as you would expect to find just north in Georgia, Alabama, and the Carolinas. Generally, the more south you go in the state, the more unlike the South it seems; you should not expect to experience 'southern' culture everywhere, although southern culture can be found in every region of the state, it is not always the most prominent. Cities such as Tampa and Orlando offer the feel of many different cultures. There are a lot of southerners in these areas, as well as people who are not from the state (midwest, northeast), whereas Miami is unique in seeming like a cross between an American metropolis and a major Latin American city (like Caracas, Rio, or Sao Paulo). There are some Seminole Indian reserves and villages throughout southern Florida (namely in the Everglades) and their indigenous culture can be experienced by visiting a gift shop and browsing arts and crafts. The southernmost Florida Keys offer yet another flavor, full of the slow paced and casual atmosphere of true beach life. 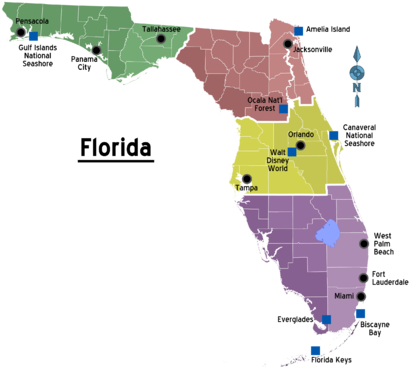 All in all, Florida is its own region of the United States in its own right. The Florida State Fair held every February near Tampa is the best event to attend to sense the varying cultures. The fairgrounds are host to a "cracker" village similar to the villages that were found in rural Florida in the 19th century. It hosts an exposition of counties, where each Florida county has a display and a representative to answer questions. In addition, the fair has animal displays and shows, an exhibition dedicated to citrus, various dance & cheerleading competitions, and a large selection of rides and games. A few weeks later, nearby Plant City host the Strawberry Festival, usually the last few days of February and first week of March. Plant City is the "Strawberry Capital of the US" and almost every food vendor at the festival offers several dishes featuring strawberries. Driving near Plant City in February and March, one can find many roadside vendors offering flats(~$10-12) and half-flats(~$5-8) of strawberries. Another common dish found at roadside vendors in north and central Florida is boiled peanuts-a southern dish usually found in "regular" and "cajun" flavors, which taste nothing like roasted peanut. Florida's Natural, a company that sells fruit juice, has a great roadside "welcome center" along US 27 in Lake Wales that includes a display and video on the history of citrus growing in Florida and offers samples of several flavors of juice. Florida's coastline is world class, with several gorgeous beaches, bays, and estuaries lying on the coast. The Floridian landscape is flat, with many lakes and wetlands throughout most parts of the state. The only exception is parts of the center in Highlands, Polk, Lake, and a few other counties where rolling hills are common. The highest point in the state is 345ft (105m) and Sugarloaf Mountain in Lake County is the highest point on the peninsula at 312ft (95m). Florida's cities tend to be big, sprawling, and well developed. For such a highly populated area there are fortunately still several areas of wilderness left (although they are often found sitting right next to a large city). Many rural parts of the state grow citrus and sugar cane, but farmland tends to be far out from the usual tourist areas. The Florida Panhandle and North Florida is mostly farmland and pine trees, but as you travel south, you'll see more wetlands and urbanization. The Florida Keys, a small chain of subtropical islands, have their own unique geography, surrounded by the beautiful waters of the Gulf of Mexico and the Atlantic Ocean. English is the official language of the state. However, Spanish is the native language of approximately 20% of Florida residents. In some parts of South Florida, Spanish is the preferred language in everyday activities. Miami is most notable, where nearly 80% of residents do not speak English as a native language and 30% do not speak any English. Tampa also has a sizable Spanish speaking population, and areas where it is almost exclusively spoken. Full sized Hotel, with all amenities and services, directly within Orlando International Airport itself. Tampa International Airport-serves the Gulf Coast, namely the Tampa Bay area. Has a direct flight operated by British Airways to/from London Gatwick. Also international flights to Canada, Mexico, Panama, and the Cayman Islands. Rated #1 US Airport overall. Other large airports can be found in: Jacksonville, Pensacola,Fort Myers, Tallahassee, St.Petersburg/Clearwater, West Palm Beach, Sarasota, Key West, Gainesville, Melbourne, and Sanford. Be aware that there are many more airports throughout Florida that may get you closer to your ultimate destination; watch out for these smaller airports while researching your destination. Amtrak Silver Star and Silver Meteor (Trains 91-92 and 97-98 respectively) - both routes begin in New York City and end in Miami. While the two routes are slightly different, within the borders of the state of Florida, the routes are exactly the same. This option can get you from most East Coast cities to Miami, or many Florida cities in between. US 301 enters Florida just north of Jacksonville and was once the main route from the Northeast to Florida. It is a very scenic alternative to I-95 with a lot less traffic. Exiting at Santee, SC motorists can follow US 301 through SC and Georgia (past the first welcome center opened in 1962) and connect to I-95 in Jacksonville for East Coast destinations or join I-75 at Ocala for Tampa and Gulf Coast destinations. Bus service is provided by Greyhound , Megabus , Falcon Charter Bus , GOGO Charters , SHOFUR  and RedCoach  that connect the major cities in Florida. There are a number of local and regional Public Transportation organizations that offer inter-city bus services throughout the state. The legal driving age is 15 if you have a learners permit. 16 on a restricted license, and 18 on a unrestricted license. Anyone 16 and under cannot drive between 11 p.m. to 6 a.m. for one year, unless with a driver who is 21 or older. Anyone aged 17 cannot drive between 1 a.m. to 5 a.m. for one year, unless with a driver who is 21 or older. Car rental agencies abound in Florida and many are available at every major airport. Orlando, in particular, known as the "Car Rental Capital of the World". With Florida being the most visited state in the US, car rental rates here are among (if not the) highest rates in the country. Like many Southern and Eastern states, Florida chose to use tolls to fund the construction of most of its expressway system rather than raising property, sales, income, or gas taxes. As a result, visitors can look forward to paying a lot of tolls, especially on Florida's Turnpike or in Orlando, where the city's entire expressway system (except Interstate 4) was built as tollways. More and more toll roads are switching over to cashless tolling, which means you should consider getting a rental car with a SunPass transponder, for which the car rental agency will likely charge you a daily fee on top of the tolls. If you don't have a transponder and drive onto such toll roads anyway, then the car rental agency will likely charge you exorbitant "convenience fees" to straighten out the resulting mess. Interstate 4 crosses diagonally from Tampa, heads east through Plant City & Lakeland, then heads northeast past Kissimmee, Walt Disney World, Orlando, and ends at Interstate 95 near Daytona Beach. Interstate 4 is the most traversed highway in Florida and due to the large volume of traffic, high speeds (70 outside of urban areas), construction (which is almost complete), and large number of tourists it is the most dangerous highway in the state, in terms of the number of accidents. Interstate 95 enters Florida from Georgia north of Jacksonville and travels near the Atlantic coast (never more than 20mi or so), past St. Augustine, Daytona Beach, Cape Canaveral, Vero Beach, West Palm Beach, Ft. Lauderdale, and ends at US 1 just south of downtown Miami. Interstate 10 enters Florida from Alabama near Pensacola and travels across the Panhandle, past Tallahassee,and through north Florida to its terminus in Jacksonville. Interstate 75 enters Florida from Georgia and runs south through Gainesville, Ocala, just east of Tampa, then parallels the Gulf coast past Bradenton, Sarasota, Fort Meyers, Naples, and then crosses due east across the Everglades swamp (a section known as 'Alligator Alley') to the Miami suburbs. Florida's Turnpike is a toll road that runs from Interstate 75 south of Ocala, through Orlando, West Palm Beach, Ft. Lauderdale, and ending south of Miami. It provides the easiest access to Orlando and southeast Florida for persons entering the state via I-75 or I-10. Interstate 275 is a secondary interstate that runs from I-75 north of Bradenton, past downtown St. Petersburg & downtown Tampa, before rejoining I-75 north of the Tampa area. Interstate 275 crosses the Sunshine Skyway Bridge, 5.5mi (8.8km) long and with a 193ft(58.8m) clearance, across the mouth of Tampa Bay and later across the Howard Frankland Bridge over Old Tampa Bay. Note: Interstate 75 does not provide access to these areas, it passes through rural/suburban areas 10 miles (at closest) from Tampa. I-4 approaches Tampa from the east, but ends at I-275 just before downtown. U.S. Highway 1 is a historic and scenic highway that originates in Key West and continues up the east coast. State Road A1A runs parallel to US 1 and Interstate 95, but lies to the east of the Intercoastal Waterway (mainly on the barrier islands) and running mostly along the ocean. US 98 enters Florida from Alabama at Pensacola and travels a very scenic route along the Gulf Coast of the Panhandle, it continues diagonally across the peninsula to its terminus in West Palm Beach. US 41 runs from Miami, makes a scenic 2-lane journey through the Everglades, and travels along the Gulf Coast, the east side of Tampa Bay, and north into Georgia. Amtrak Silver Star and Silver Meteor (Trains 91-92 and 97-98 respectively) - This is a relatively expensive option but will suffice if other means are not possible. Both routes span from Jacksonville to Miami. While the two routes are slightly different, within the borders of state of Florida, the routes are exactly the same and stop at the following stations: Jacksonville, Palatka, DeLand, Winter Park, Orlando, Kissimmee, Lakeland (to/from the north only), Tampa, Lakeland (to/from the south only), Winter Haven, Sebring, Okeechobee, West Palm Beach, Delray Beach, Deerfield Beach, Fort Lauderdale, Hollywood, and Miami. 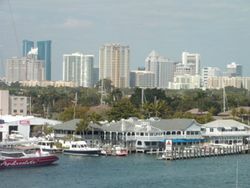 A high speed ferry service operates from the cities of Fort Myers Beach and Marco Island to Key West. The Key West Express  . offers daily service and docks in the Historic Seaport district of Key West. The ferry ride takes approximately 3.5 hours and the Ft. Myers Beach vessel has a capacity exceeding 450 passengers and amenities aboard include; out-door sundecks, flat-screen TV's, galley service and a full bar. Additionally, the Marco Island vessel features the same amenities as well as a capacity of over 250 passengers. Space Shuttle Launch-Florida is the only place in the world where one can watch the launch of a manned space vehicle launch, as Russia & China launch their space craft in remote, restricted areas. On clear days, a launch can be seen well from over 150mi(250km) away. However, seeing a launch from Titusville is worth attending, especially for international tourists. Furthermore, rockets (carrying satellite)s are launched almost every month. You can check the launch schedule online . St. Augustine, founded by the Spanish in 1565, is the United State's oldest continually settled city. It contains a large fort, a museum concerning the city's history, and plenty of nearby shops. Gatorland - Full of Florida's most unique animal, in Orlando. 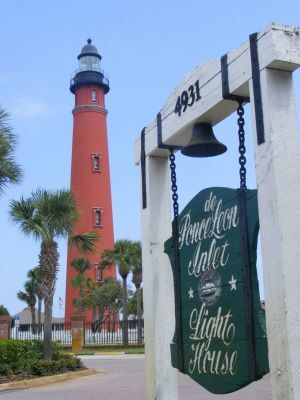 Florida Lighthouses are numerous, historic, and beautiful, take some time to visit these iconic images of the coast. Spring Training Baseball occurs throughout the state in March and offers the ability to watch your favorite players for discount prices (front row tickets can be purchased as low as $15-20) and in smaller, more intimate venues. Salvador Dali Museum,, in downtown St. Petersburg, is the largest collection of Dali artwork outside of Europe. Sunshine Skyway Bridge is part of Interstate 275 crossing the mouth of Tampa Bay. It is the longest cable-stayed bridge in the world and an engineering masterpiece. Furthermore, two long fishing piers beside the bridge, the approaches of the previous bridge, are renowned among local fishermen and provide a less expensive alternative for saltwater fishing. Florida Holocaust museum,, located in downtown St. Petersburg. The Holocaust museum is one of the largest in the US and exhibits a box car used by Nazis to transport prisoners to concentration camps like Auschwitz or Treblinka. Daytona International Speedway, located 1.5 miles off the Daytona Beach exit (261) on I-95. Home of the number one event in stock car racing - the NASCAR Nextel Cup Series Daytona 500 (February) and other events throughout the year. Go to the beach! You have numerous options with Panama City Beach, Daytona Beach, South Beach, and West Palm Beach being some of the best. Visit Florida's world class water parks and theme parks. Disney World - The biggest and most renowned theme park in the world. Sea World, Wet and Wild, Universal Studios, Islands of Adventure, and Discovery Cove in Orlando. Visit Everglades National Park, a place like no other on earth, and take an airboat ride through the swamps. A drive across the Everglades on US 41 is a great way to get a sense of the size and scenery of the Everglades. Stop at Shark Valley and Everglades City for great attractions and scenery. Take a dip in Florida's Largest Lake, Lake Okeechobee! Wade in the shallow waters, and enjoy the beautiful southern Florida landscape and wildlife. Go diving-Florida coastlines offer many coral reefs, sunken vessels, and a diverse array of sea life. Go hiking or backpacking-Florida has many state and national parks/forests that have nature trails suitable for hiking and camping. Florida National Scenic Trail is a network of 1400 miles of hiking trails throughout the state. The most popular section of the trail is the 110-mile loop encircling Lake Okeechobee. Take a Cruise - leave from the Port of Miami,Tampa, Ft. Lauderdale, or Canaveral. Florida cuisine has come under many influences and its styles vary across the state from north to south. Early Spanish and African and Southern cuisine has been influenced by Cuban and other Caribbean cultures, as well as "snowbirds" escaping from the Northern US winters. Northern Florida has a more Southern style; the south a more Caribbean one. Being on a peninsula, Florida's chefs have always had access to fresh seafood and the long growing season provides for fresh native vegetables. Citrus is a main export, and the tourist is apt to see many roadside stands offering free samples of orange juice and fruits to be shipped or carried home. Florida also grows grapefruit, avocado, mango, papaya, passion fruit, kumquat, coconut and other tropical fruits. These often provide the base for sauces and marinades or are used in marmalades, soups, or desserts. Welcome centers located on I-10, I-75, and I-95 as you enter Florida offer free samples of orange juice to all visitors, a tradition that goes back decades. Strawberries are another popular fruit in Florida. Plant City, off I-4 east of Tampa, is the center of Florida strawberry growing, where during the peak season (Feb-Mar) many roadside vendors offer flats(16 pints/12 lbs) and half-flats of strawberries for a small fraction of grocery store prices. Since most are owned by the individual farmers, often the fruit sold was harvested that morning or the day before. Fresh Florida strawberries are a treat no tourist should miss, at least if you visit while in season. Grouper is a very popular seafood caught in Florida's coastal waters. Fresh grouper is offered in many coastal cities, where many local restaurants buy it straight from fishermen. In recent years, state inspectors have cracked down to insure that all restaurants offering "grouper" are in fact serving grouper, and not another less expensive white fish. Snapper, Snook, Tarpon, Marlin, & shark are other Florida fish that you can find at coastal restaurants, although they are not nearly as ubiquitous as grouper. Southern food is available throughout most of north and central Florida. Barbeque is popular throughout the state, with many small "barbeque shacks" to choose from. Any platter costing over $10 ($15 for ribs), should be avoided as less expensive restaurants are almost always best. Sweet tea is common throughout the state, although unlike most areas in the south you have a choice between sweet and unsweet. Boiled peanuts can be found at roadside vendor in this area also, certainly worth trying. Dishes such as grits, okra, gravy 'n biscuits, and collard greens can also be found in buffets and restaurants throughout the region. Cuban food is common in the Miami and Tampa areas. The most common dishes are Cuban sandwiches, desserts, & black beans and rice. Local specialties, not readily available in many other locales, include alligator. It is healthy and most say it tastes like chicken. It is often prepared like chicken too. Key lime pie, found elsewhere now, is a Florida Keys invention, made from the local key limes. Alcoholic beverages abound throughout the state. However, five rural counties in the northern third of the state are "dry counties", and no alcohol is sold in them. Liquor stores are often built into strip malls, supermarkets, and pharmacies, and most grocery stores, gas stations, and convenience stores sell beer and wine. Bars and clubs are popular throughout the state. Miami Beach is well known for a variety of themed and upscale bars with innovative mixed drinks. Like every other U.S. state, the purchase and possession age for alcohol is 21 and is fairly well enforced. Underage drinking "stings" are frequent in most tourist areas. Be aware that some counties in Florida are dry counties, that means sale of alcohol is either prohibited or restricted. Currently, Lafayette County, Liberty County, and Washington County are dry. Most goods for sale in the state are subject to sales tax. In most of the state, the rate is 7% but varies from 6%-7.5% (6% state sales tax and up to 1.5% local sales tax). This rate is almost never listed on the advertised/displayed prices. Florida is increasingly becoming a major destination for shopping. The Orlando and Miami areas are home to a plethora of shopping malls, including many "outlet" malls which are home to shops selling brand-name products for discounted prices and retail shops of name brands which typically are sold through retail companies (Nike, Sony, Tommy Hilfiger, North Face, etc). There are also a large number of stores selling souvenirs, although most are not locally produced. The Orlando/Kissimmee region, especially, has a much larger number of retail stores that is typical of US cities. While traditionally they catered largely to American families on vacation, these shopping destinations are now serving foreign shoppers. Europeans (and more recently Brazilians) flock to these shopping centers to buy products significantly cheaper than at home and it's not uncommon at some shopping centers in Orlando to encounter tourists from around the globe (especially on weekdays, when most Americans are working). As with the rest of the United States, prices even after sales taxes tend to be much lower than in other countries because the U.S. (except Hawaii) has no value-added tax, and quality is much higher due to the bargaining power of the huge U.S. retailers. In the last few years, Brazil has become the largest source of international visitors to the state, with many coming on shopping group tours, sometimes wearing matching shirts. Some major shopping centers in Orlando and Miami areas now offer services in Portuguese. Florida has been the favorite place for renters from the last two decades. It is also called Sunstate. Florida is one of the biggest places for vacation rentals owners. Never leave children or pets in a parked car for any length of time! Due to high temperature for most of the year, the interior of a parked car can easily heat to lethal temperatures in a short amount of time. During the summer, the interior of a parked car can reach 130-170ºF (55-75ºC) in just 15 minutes, regardless of the color of the exterior or interior, nor whether the windows are open a small amount. You not only risk their lives, but it is illegal and the consequences could be thousands in fines and even imprisonment. Florida has a high occurrence of hurricanes. You might want to check the hurricane safety page if you are visiting Florida during hurricane season (June 1-November 30). Watch where and when you swim. While the beaches are great they often harbor rip currents, bacteria, and jellyfish. Always check with the lifeguard stand before heading in if no one is in the water or the waves are rough. Volusia County is known for a high number of shark attacks, so be careful when surfing. Even so, the number of attacks are less than 50, with a fatal attack every 2-3 years, amongst millions of visitors and residents who swim in the ocean. Swimming near dusk and dawn is most hazardous. Never swim in the lakes or rivers unless signs tell you swimming is safe. In Florida, stagnant and slow moving freshwater often has alligators (as well as poisonous snakes). While they rarely attack humans, it's best not to take your chances. Florida has varying crime intensity from city to city. In certain parts of large cities it may not be safe to walk alone or even in small groups at night. These are the exceptions however and most of Florida is safe enough for visitors. Tourist-oriented areas rarely have violent crimes, but theft is an occasional occurrence. If the area doesn't feel safe then it probably isn't. Florida is notorious for giant sinkholes. Most of Florida sits on a huge limestone slab. If rainwater mixes with the right substances (natural or man-made) it can become acidic and eat away at the limestone until a large area is undermined and then suddenly collapses. Fortunately, they are rare, but when they occur, they can cause buildings, cars, and even people to suddenly vanish into the ground. Visitors need to be aware that Florida is a statewide No Loitering zone, especially under Florida State Statute 810.09 and 856.021, which allows all police officers statewide, whether local, county, or state police, to order any person to leave any premises of any property. No property is exempt from the statute; not restaurants, not hotels/motels, not shopping malls, not clubs, no, not even parks (including amusement parks) and/or beaches. Visitors need to be aware that the state government operates agricultural inspection stations along major highways coming into the state to control agricultural products going into or out of the state. These inspection stations are located at various distances from the state border itself, anywhere from just within the border to 50 miles within. Signs posted on approaches to these stations indicate that "all trucks, trailers, vans, and pickups must stop for inspection." All plants, animals, fruits, vegetables, firewood, and other agricultural products must be declared. Anyone driving a vehicle in this category and not stopping risks being pulled over by a police patrol and ticked or arrested. It appears that the state government has zoned Florida into two portions (the western panhandle area and the more sensitive peninsular area) with a line of control along the Suwannee River. Florida is known around the world for its balmy weather. The climate varies from humid subtropical (like the rest of the southern states) in the north (from Pensacola down to Tampa) to tropical in the south (from Fort Myers to Key West), hosting a variety of near equatorial climates including subtropical rainforest, subtropical monsoon, and semi-tropical savanna. The state's generally mild winters have made it a haven for retirees year-round and temporary residents during the winter known as "snowbirds". Summers can be long and hot, with the interior being a few degrees warmer than the immediate coast. Coastal areas also experience gentle breezes during the summer, and the beach is usually the coolest, least humid place to be. During the winter, coastal areas are warmer, slightly, than inland areas. The Atlantic side of Florida is noted for milder, more moderate weather, as opposed to the Gulf side, which is drier and cooler during winter, and hotter and muggier in summer, than the Atlantic coast. While coastal breezes are a welcome relief from the scorching temperatures, they are also the cause of the most notorious Florida weather feature: thunderstorms. While the storms are often brief, they are common, and anyone visiting Florida during the rainy season (mid-June to September) should plan a few activities indoors in the afternoon as a backup plan. Florida's thunderstorms occur almost everyday during the rainy season and typically form 20-30mi inland and either move toward the center of the state or toward the coast. While most simply cool the air bringing a welcome relief to stifling temperatures, these storms produce considerable amounts of dangerous lightning and sometimes hail, high winds (50mph+), and tornadoes. See the "stay safe" section for thunderstorm safety. Many attractions such as Disney World have multiple attractions available even during downpours. It is common to be in a rain shower yet be in the sun at the same time. It is also an interesting contradiction that rain can be occurring just a few miles inland from the coast, while those at the beach experience a beautiful day. Cold weather occasionally affects Florida, even as far south as Miami and the Keys. The above temperatures are average temperatures throughout the day. During the summer, high temperatures on the peninsula are usually around 90 on the coast and mid 90s inland...with lows ranging from around 80 on the coast to mid 70s inland. During the winter, temperatures are much more variable. It is best to consult the individual city page for temperatures during the winter. The spring is the driest time of the year, which can lead to wildfires nearly every May and early June. 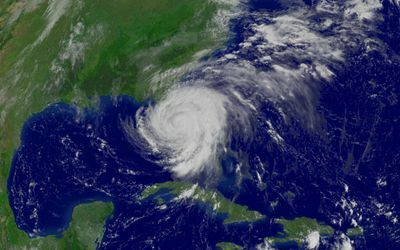 The six-month hurricane season runs from June 1 through November 30 and Floridians have learned to be ready when a storm threatens the area. If you plan on visiting during the summer, stay ready of the news and weather advisories. Information is available from the National Hurricane Center . Please note that this list does not include honorary consulates. Always call ahead to determine if the consulate offers the services you require such as passports, visas and other official documents as these services are increasingly being centralized at other locations. Some websites are available only in Spanish. If a country isn't shown here, it will be represented by an Embassy in Washington DC. Georgia - Heading out of Florida to the north is Georgia. Here you will find the historic city of Savannah and the resort beach of Jekyll Island. Alabama - North of the Panhandle is Alabama, where Mobile is a historic port city and Gulf Shores is a popular resort. Caribbean - The islands of the Caribbean are accessible by boat and plane from Florida and offer a variety of both relaxing and adventure travel amidst a tropical paradise. For those interested in visiting the Bahamas, many owners of small boats will make the day-long trip to the Bahamas and several small airlines offer fares to the Bahamas for under $70 each way.